Contributions have formed a significant part of JPA’s business for many years. In particular, we were involved with some of the earliest implementations of the Bloomberg Multi-Product Feed, going back to the days when it was transmitted over asynchronous cable. We were also instrumental in developing the publishing infrastructure for the Telerate TTRS product. So it was hardly surprising that when we sat down and started to develop the PlatformOne™ product set that contributions were absolutely central to the overall concept. The net result of this focus is that there is now a complete stand-alone subset of the PlatformOne™ product that deals with contributions. So our clients get the best of both worlds. Not only can they can have a complete off-the-shelf contributions package, but they can also benefit from the additional features that being part of a fully-functional market data platform brings them. The data source can either be some kind of internal PlatformOne™ cache (perhaps based around the Calculator product) or a connection to another system. Sub2Pub watches records, applies rules and, optionally, chain ownership, and publishes the results to one or more of the available contribution servers. Chain membership can either be static or dynamic. In dynamic chains, the selection of chain is made according to the value of a given field, and the position of each record is determined by the value of up to three fields, in either ascending or descending order. Records and rules may be added, deleted or amended without restarting Sub2Pub, either directly via Sub2Pub‘s own GUI (in the case of the Windows implementation) or via a separate GUI (in the case of the Unix implementations). 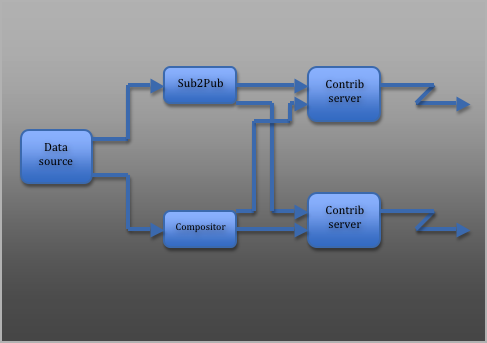 Two instances of Sub2Pub may be set up as peers, so that any change made to one is synchronised with the other. If the list of records in a templated or linked section is larger than the available area, another page is automatically created with a page number one higher than the existing one. There are three contribution servers currently available, for Marketlink (all flavours), Bloomberg MPF and the Bloomberg Platform. You can connect as many instances as you need, either load balanced or duplicated as appropriate. These contribution servers also provide their own feeds that can be used for statistical analysis or by Tracker for latency monitoring.